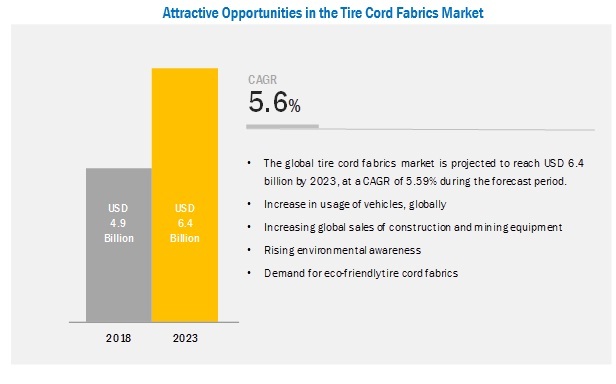 [129 Pages Report] The tire cord fabrics market size is estimated to be USD 4.9 billion in 2018 and is projected reach USD 6.4 billion by 2023, at a CAGR of 5.59% between 2018 and 2023. The increased vehicle demand, especially light-duty vehicles, around the globe has increased the global vehicle production in the past few years. Subsequently, with the growing vehicle sales, there is an increase in vehicle parc. These factors have indirectly fueled the global tire cord fabrics market. 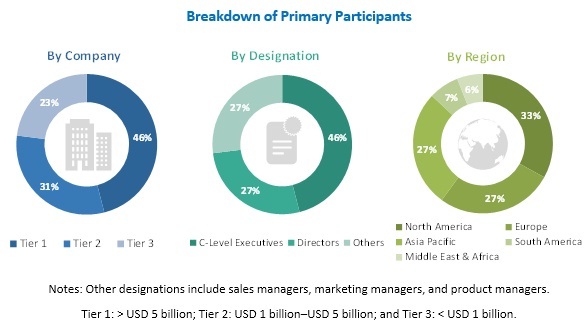 APAC is the key market for tire cord fabrics, globally, followed by Europe and North America. The growing demand for eco-friendly tire cord fabrics is expected to provide opportunities for the market. Nylon is expected to be the largest segment of the overall tire cord fabrics market during the forecast period. On the basis of material, the tire cord fabrics market has been segmented into nylon, polyester, rayon, and others. The nylon segment is estimated to register the highest CAGR, in terms of value, of the overall tire cord fabrics market. The growth of the nylon segment is expected to continue during the forecast period due to the increasing demand for high-strength tire cord fabrics from different vehicle types, including passenger cars, lightweight vehicles, and heavyweight vehicles. The radial tires segment is expected to be the largest tire type during the forecast period. On the basis of tire type, the tire cord fabrics market has been segmented into radial and bias. The radial segment accounted for the largest market share in 2017. The dominance of the segment is owing to the increasing production of passenger cars. Replacement segment is projected to be the largest application of tire cord fabrics during the forecast period. On the basis of application, the tire cord fabrics market has been segmented into OEM and replacement. The replacement segment is projected to dominate the tire cord fabrics market during the forecast period. The dominance of the replacement segment can be attributed to the increasing number of vehicles on road and age of vehicles. APAC is expected to account for the largest share of the tire cord fabrics market during the forecast period. APAC is estimated to be the fastest-growing market for tire cord fabrics during the forecast period, in terms of value. The growth is attributed to the increase in car production in developing countries such as China, India, and Indonesia. Key market players profiled in the report include Indorama Ventures Company Limited (Thailand), Kolon Industries Inc. (South Korea), Hyosung Corporation (South Korea), SRF Limited (India), Kordsa Teknik Tekstil A.S. (Turkey), Teijin Limited (Japan), and Toray Industries Inc. (Japan). Indorama Ventures Public Company Limited, through its wide range of product portfolio, is able to cater to the specific needs of end customers. The company, through its innovative products & solutions, has been able to serve a wide range of end customers. The company has made a large number of acquisitions, which has enabled it to strengthen its position in the tire cord fabrics market. For instance, Indorama Ventures Company Limited (IVL) acquired Kordarna Plus S.A. The acquisition will help the companies broaden their product portfolio and strengthen their position in the market. Kordsa is into developing eco-friendly products, which has enabled it to stay competitive and cater to the specific needs of customers and adhere to the regulations. For instance, Kordsa developed eco-friendly tire cord with a technology, which enabled the use of more environment-friendly chemicals as compared to harmful chemicals such as resorcinol-formaldehyde which have always been used in the production of tire cord fabrics. The company is also continually expanding its geographic reach. For instance, Kordsa established its second tire cord fabric and polyester yarn facility in Indonesia. It is opening two new plants including an 18-kiloton tire cord fabric plant and a 14-kiloton 3rd and 4th generation polyester HMLS yarn plant. This would enable the company to expand its geographic reach in the APAC region. In October 2018, Indorama Ventures Company Limited (IVL) acquired Kordarna Plus S.A. The acquisition will help the companies broaden their product portfolio and strengthen their position in the market. In June 2017, Indorama Ventures Company Limited (IVL) acquired Glanzstoff Group (Netherlands) tire cord and single-end cord businesses. The acquisition will enable the company to strengthen its position in the rayon, nylon 6.6, and polyester businesses within the auto segment. In January 2017, Indorama Ventures Company Limited (IVL) expanded its tire-cord manufacturing line at its Performance Fibers facility in Kaiping, Guangdong Province, China. The expansion will help the company strengthen its presence in the high value-added automotive safety market. In June 2018, Hyosung built a new factory in Quang Nam Province, Vietnam to strengthen its position in the global tire cord fabrics market. In November 2016, Kolon Industries invested USD 260 billion to set up a new tire cord plant in Vietnam. The expansion enabled the company to expand its automotive material business. Where will all the developments take the industry in the mid to long term? What are the upcoming types of tire cord fabrics? What are the emerging applications of tire cord fabrics? 11.8.5 Kordsa Teknik Tekstil A.S.
12.5 Kordsa Teknik Tekstil A.S.
12.11 Shenma Industrial Co. Ltd.
12.12.2 Madura Industrial Textiles Ltd.
12.12.8 Formosa Taffeta Co. Ltd.
12.12.9 Oriental Industries (Suzhou) Ltd.
12.12.11 Hangzhou Dikai Industrial Fabrics Co., Ltd.
12.12.12 Shandong Helon Polytex Chemical Fibre Co., Ltd.
12.12.13 Shenma Industrial Co., Ltd.
12.12.14 Dongping Jinma Tyre Cord Fabric Co., Ltd.
12.12.15 Zhejiang Hailide New Material Co., Ltd. The study involved four major activities in estimating the market size for tire cord fabrics. Exhaustive secondary research was done to collect information on the market, the peer market, and the parent market. The next step was to validate these findings, assumptions, and sizing with industry experts across the value chain through primary research. Both top-down and bottom-up approaches were employed to estimate the complete market size. Thereafter, the market breakdown and data triangulation procedures were used to estimate the market size of the segments and subsegments. The tire cord fabrics market comprises several stakeholders such as raw material suppliers, end-product manufacturers, and regulatory organizations in the supply chain. The demand side of this market is characterized by the development of the automotive industry. The supply side is characterized by advancements in technology and diverse application industries. Various primary sources from both the supply and demand sides of the market were interviewed to obtain qualitative and quantitative information. After arriving at the overall market size-using the market size estimation processes as explained above-the market was split into several segments and subsegments. In order to complete the overall market engineering process and arrive at the exact statistics of each market segment and subsegment, the data triangulation and market breakdown procedures were employed, wherever applicable. The data was triangulated by studying various factors and trends from both the demand and supply sides in the automotive industry. Indorama Ventures Company Limited (Thailand), Kolon Industries Inc. (South Korea), Hyosung Corporation (South Korea), SRF Limited (India), Kordsa Teknik Tekstil A.S. (Turkey), Teijin Limited (Japan), and Toray Industries Inc. (Japan). Top 25 major players covered. This report categorizes the global tire cord fabrics market based on material, tire type, vehicle type, application, and region.